Two entrepreneurs continue to build buzz around their product and service. Both Christel Seeberger and Henry Yates went through Economic Development Greater Saint John’s Venture Validation Program (VVP). “The whole point of the VVP program is to help you validate your idea. We felt fairly confident that we were on the right track after it finished up in July 2018. Since then we spent more time in the market seeing how people react to wine in cans and building an audience at the same time with events,” says Yates, owner of Enso Beverage Company. 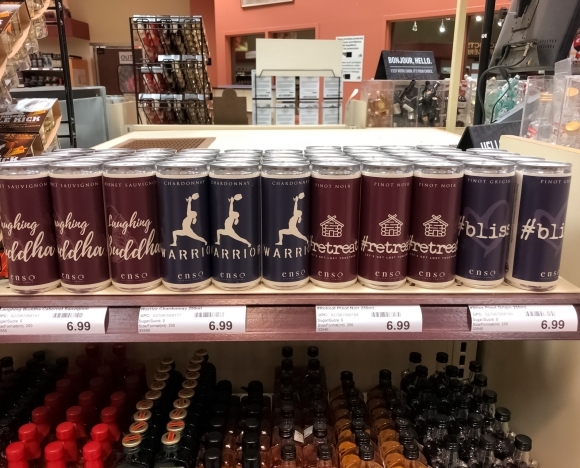 The demand for premium canned wine is growing as the company’s Chardonnay, Pinot Grigio, Pinot Noir and Cabernet Sauvignon is now available at nine ANBL outlets and local businesses like Hammond River Brewing Beer Bar, Hopscotch Whisky Bar, Picaroon’s General Store, Grimross Brewtique and the Bunkhause Hostel. “The goal over the next 6 months is to expand sales in the New Brunswick market. By the end of the year, we want to launch some new wine varietals and expand to new markets in Atlantic Canada and Ontario,” adds Yates. Christel Seeberger’s Sensory Friendly Solutions business concept also started in VVP in 2017, but like Enso Beverages, it was just the first step in the entrepreneurial journey. “Since participating in VVP, the business has become even more laser focused on bringing sensory friendly information on places, events and products for people with autism, anxiety, concussion, dementia, hearing loss, PTSD, sensory processing disorder, vestibular disorder and vision loss,” says Seeberger. Seeberger recently received some funding through EDGSJ’s Smart & Connected Data Project to create an app for sensory friendly seekers. She’s building a data base of sensory friendly information and is currently testing out potential app features on the company’s website. Both Yates and Seeberger also just made the top 10 finalists for New Brunswick Innovation Fund (NBIF) Breakthru competition on March 21 at the Fredericton Convention Centre. If they place in the top 3, they can win up to $200,000 in capital, mentoring and support from successful founders and companies across the province. “I feel with all the help provided that I’m already winning. I can’t say enough good things about the program and it’s helped me hone my business plan and allowed me to practice my pitch skills,” says Yates. Seeberger has had a similar experience. Both entrepreneurs say people need to know if they want to start a business, there is a huge eco-system ready to help make that happen. “Economic Development Greater Saint John’s VVP is a great place to start if you have an idea. Other organizations like Atlantic Canada Opportunities Agency, Opportunities New Brunswick, StartupNB are helpful in the later stages of business development and I’ve also heard great things about the OASIS program at New Brunswick Community College,” says Yates. “There is indeed a very supportive ecosystem to support entrepreneurs here. While navigating the system can be a challenge, there is always someone you can ask who can lead you in a better direction or to another expert,” adds Seeberger.